Let's look at some of the reasons your car insurance might be more expensive than average. What makes auto insurance expensive? Many factors — both related to driving and otherwise — lead to expensive auto insurance premiums. Age, driving record, credit score, and insurance history each play into car insurance rates. We outline below reasons auto insurance could be expensive, along with some ways to save. Credit score is a primary contributor to car insurance rates. Federal Trade Commission studies show drivers with poor credit file more claims than drivers with high credit scores, and file more costly claims. These drivers pose considerable risk to car insurance companies. 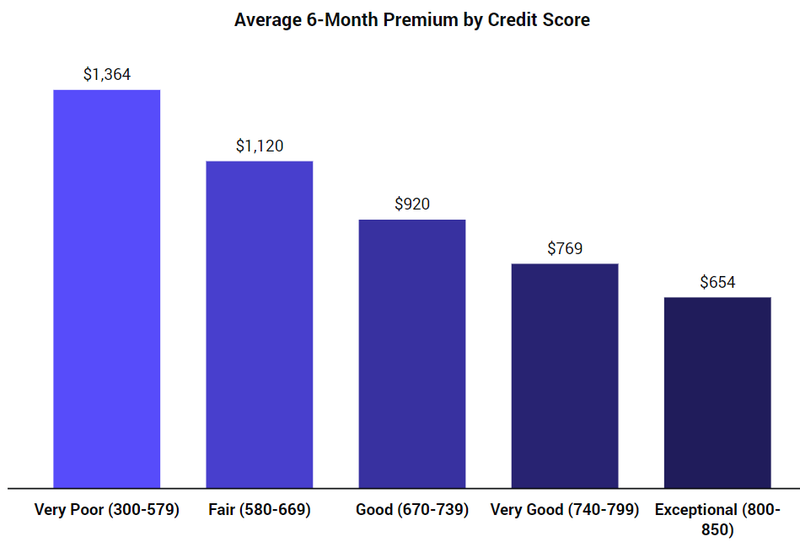 On average, drivers with credit ratings in the "Very Poor" tier (300-579) pay $710 more for a six-month policy than do drivers with credit scores in the "Exceptional" range (800-850). Each tier of credit score improvement comes with an average savings of 17% — or $177 per six-month term — on auto insurance premiums. If you have a clean driving record but think your rate is too high, check your credit score. Why is credit used in insurance pricing? Car insurance companies typically conflate age and driving experience. Drivers younger than 25 often pay more for car insurance than do older drivers, due to a perceived lack of driving experience. 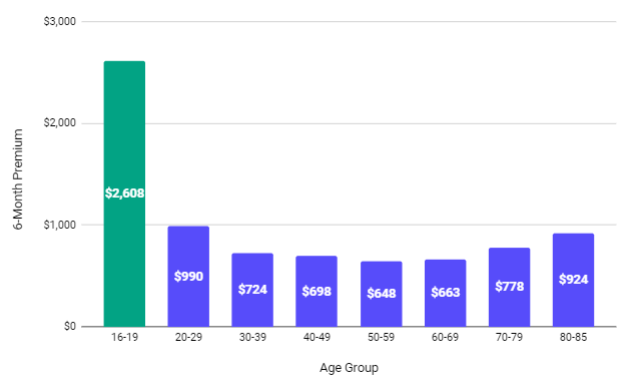 Drivers between the ages of 16 and 24 pay 158% more than drivers between the ages of 25 and 75. As a driver ages, their auto insurance premiums typically decrease. Drivers see big savings on their 19th, 20th, and 25th birthdays, specifically. Young drivers should be especially mindful of displaying good driving habits. A bad driving record coupled with an age of less than 25 will lead to high premiums. A driver's auto insurance premium could be expensive because of recent claims or driving violations. Speeding tickets, at-fault accidents, and DUIs have major implications on insurance premiums. After any violation or claim, an insurer will upcharge a driver for 3 to 5 years. In California, drivers can be charged for up to 10 years after being convicted of DUI. 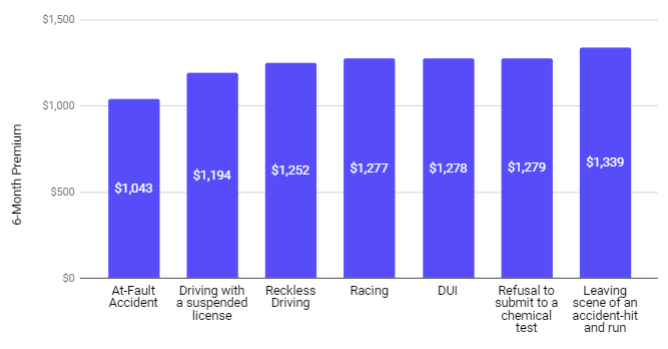 Below are the most expensive driving violations. For example, a driver convicted of a hit-and-run should expect their premium to increase by an average of $604 per six-month period. Comprehensive claims, generally considered to occur outside of the control of the driver, increase premiums by lesser amounts. On average, a comprehensive claim raises rates by $32 every six months. A not-at-fault accident also leads to elevated rates. Even when a driver was not at fault in a collision, car insurance companies raise rates to cover the cost of the claims adjuster and overhead fees. Even without filing a claim, driving history could be a reason for expensive auto insurance rates. Car insurance is regulated at the state level and priced at the ZIP code level. A driver could end up paying high car insurance rates because of claim frequency in their neighborhood or because of legislation in their state. Let's look at some of the most expensive states for car insurance. Michigan requires no-fault insurance with unlimited Personal Injury Protection. The insurance coverage options offered in Michigan attract insurance fraud, litigation fees, and expensive healthcare bills. Insurance companies have to charge higher premiums in Michigan to earn a profit. Michigan’s average premiums are 141% more expensive than Illinois, Wisconsin, Indiana, and Ohio. Even with a great credit score and no claims, living in Michigan can cost you. Florida is the fourth most expensive state in which to get car insurance. At $1,030 for a six-month premium, the Sunshine State's insurance costs are 43% higher than the rest of the US. The major reason for this is the insurance companies' loss-to-profit ratio in Florida. Hurricanes and flooding result in car insurance companies paying out heavy claim losses on a regular basis. Another reason why Florida is more expensive than average is its no-fault insurance. Although it does not require as much coverage as Michigan’s no-fault coverage, the state requires drivers to carry Personal Injury Protection at a minimum of $10,000. California is the ninth most expensive state for car insurance, with an average six-month premium of $908 — 26% higher than the US average. Unlike Florida and Michigan, California is not a no-fault state and currently maintains very low liability coverage requirements. California is an expensive state for car insurance due to its population density and claim-to-profit ratio. Cities with high population density — and thus more vehicles — are more likely to have more accidents and claims, which in turn impacts insurance premiums. Claim payouts via wildfires in California lower the profit-to-loss ratio for insurers. Although Texas is not a no-fault state with average minimum liability limits, it remains the eighth most expensive state for car insurance. Texas is just slightly more expensive than California, at $914 for a six-month policy — 28% more expensive than the US as a whole. Like California, car insurance is expensive in Texas because of cities with high population densities and high claim rates. You can’t swap states simply because Texas has a higher cost of car insurance than Oklahoma. Nor can you improve your credit score overnight. The only instant action you can take to lower your premium is to switch car insurance companies, as one of the primary reasons you might be paying too much for car insurance is your car insurance company. Enter your ZIP code below to see car insurance quotes from major auto insurance companies.